Elias Crespin with “Plano Flexionante 4”, 2013. Elias Crespin uses custom-software-controlled motors to animate the modular geometric structures he creates. 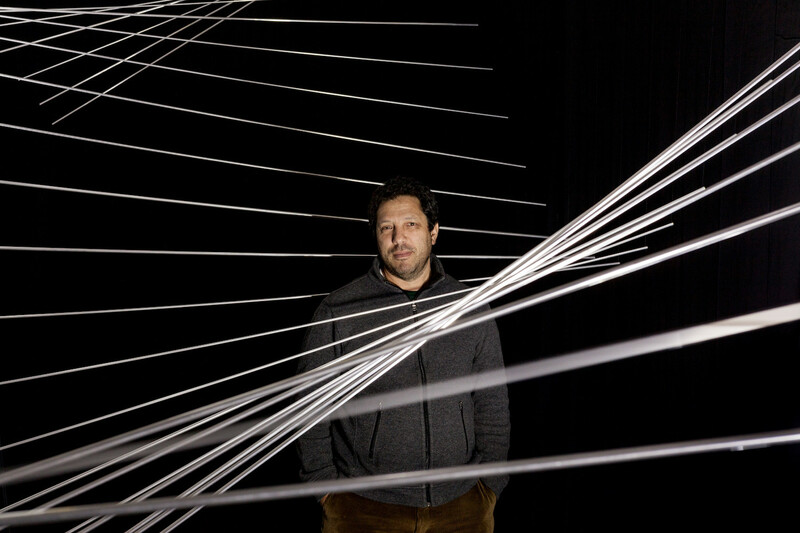 His installations consist of arrangements of metal hand formed elements or single elements in geometric shapes, which are suspended in midair by nearly invisible nylon threads. Through computer programming, they constantly shift and mutate, producing highly nuanced choreographic effects. His work questions the concept of form, space, movement and time and it’s often associated with the study of color, the experimentation of different materials and textures, of light and shadow. Elias Crespin grew up in Caracas, where he was originally trained as a computer engineer. His parents were both mathematicians, his grandparents were artists: his work perfectly integrates these two personal universes, science and art. It was only later in his career, in 2002, after having worked for fifteen years in software programming, that he started developing his first piece. He finished it after two years of research. Since 2004, his sculptures have been shown in international cultural institutes like the XIII Bienal de Cuenca 2016, Busan Biennale in Korea in 2014, in the Museum of Fine Arts Huston, in the Grand Palais and the Espace Culturel Louis Vuitton in Paris, in the Boghossian Foundation, the Maison particulière, the Verrière Hermès in Brussels. They have entered the collections of important institutes such as the Museum of Fine Arts Huston, El Museo del Barrio in New York, the MALBA in Buenos Aires. Since 2008 he lives and works in Paris.